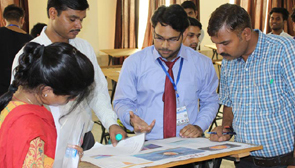 Design Innovation Center, G. L. Bajaj Institute of Technology and Management has organized National Level Design Championship “PARIKALP 2016” in association with TATA Technology Limited and Lelogix Design Pvt. Ltd. on 28 and 29 September 2016. The event has been executed in six different phases which includes 2D Championship, 3D Championship, Clay Modeling, Poster Display, Project Display and Innovative Idea Presentation. More than 300 students participated in this event. Apart from this, a session on sketching and styling has been delivered by Studio 34 Designart Pvt. Ltd. and an expert lecture by Dr. R. K. Mishra, Gautam Buddha University. Six institutes participated in different categories like 2D Drafting, 3D Modelling, Innovative Idea Presentation, Poster Display, Project Exhibition, Clay Modelling and sixteen winners were announced.